So why is it private now? Sometimes a "deal" is made for the right type of mare....could be one reason. Here are three reasons, lol. Is he not Rousing Sermon's daddy too? Yes i think he is? I think the reason the fee is private is; 1. His book is full for the year at $10,000 for the last half of the breeding season. He bred 124 mares this year, more than he has ever bred in a year. 2. I think they are waiting to see the out come of the Triple Crown to determine his fee for next year. Therefore, the fee is posted, "Private"
IHA's daddy's fee jumped the moment he won the Derby. From what I've read they seem to be a bit more keen on the 2014 filly. But I really would hope to see an updated photo of the 2013 yearling. 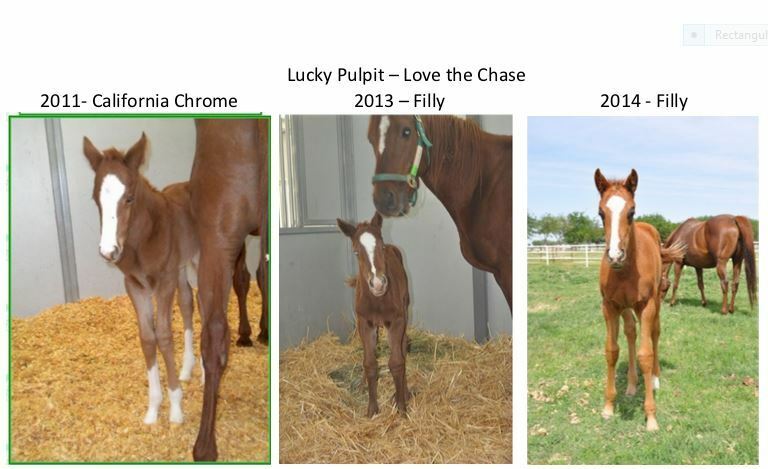 They did say they felt the 2014 was "something special"
Someone made a comment about a half-sister to Love the Chase named So Ya Know. Apparently she collapsed on the track after returning to be unsaddled in her final start at Suffolk (9/18/2007). Hate to think of what conditions/and type of owner(s) she was subject to. I looked her up and was surprised to see that while she had a modest race record it was not that bad (15 starts, hit the board 11 times) and certainly now with the success of Love the Chase one can’t help but dream about a ‘what if’ scenario of breeding her also to Lucky Pulpit. What a crying shame. Poor, So Ya Know. Always the dreamer I wish I could get my hands on one of those other half-sisters. She’d be booked to Lucky Pulpit faster than I can type ‘Lucky’ three times. And before anyone can stomp on my dreaming by pointing out the obvious, yes I know the odds of coming close to another CC are all but nil. But this is what horse breeders do – dream. Especially_Horses, How many sisters does Love the Chase have? Do you know? Or maybe send one of the half-sisters to Not for Love, the sire of Love the Chase. I'd be interested in knowing what the owners of those half-sisters are thinking concerning the famous connection their mares now have with a Triple Crown contender. If all of a sudden I found myself the owner of mare who was a half sister to Love the Chase I'd be "California Dreaming" for sure. Not For Love (Mr. Prospector—Dance Number, by Northern Dancer), is a stakes-placed full brother to 1989 champion juvenile male Rhythm. 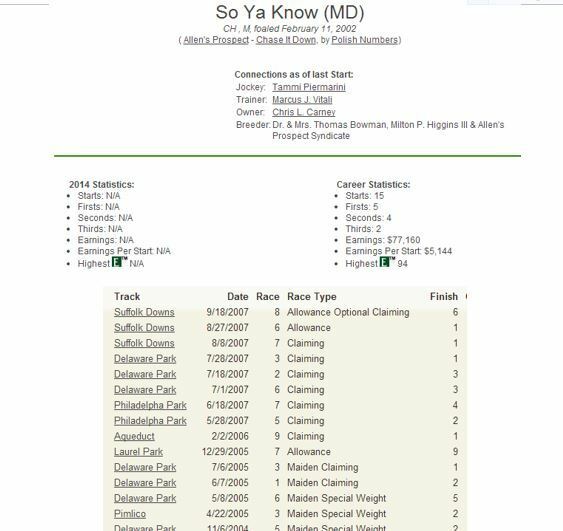 While Rhythm flopped at stud, Not For Love led the Maryland sire list for nine consecutive seasons (2003-11). He is still active at Northview Stallion Station at an advertised fee of $15,000 and has sired 75 stakes winners. With a 3rd on the way! Lucky Logan is entered May 30th in a Maiden Special Weight for 2 year old California bred or sired colts going 4 1/2 furlongs on the dirt. He will be ridden by Edwin Maldonado. He is trained by Peter Miller and owned by Navarro or Rockingham Ranch. A little diversion for California Chrome this a.m, stands in gate, gallops only 1 1/4 miles, was a bit of a handful coming down stretch.